Homepage. This page: An old invoice and receipt for a secondhand motor-car purchased from this garage. 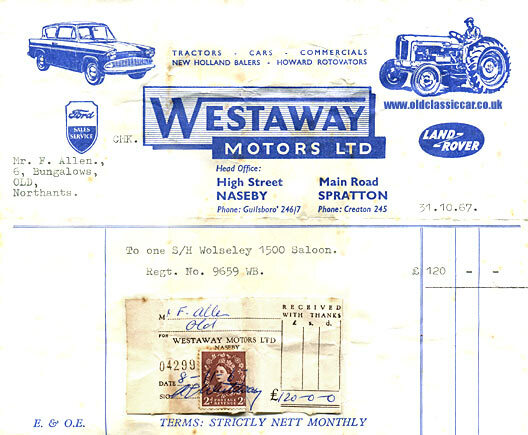 A Wolseley purchased from Westaway Motors. Most of the old garage and dealer invoices featured in this section are from the 1940s or earlier, as later ones tend to be less interesting to look at. This one though is, unlike many of this era, neatly illustrated, with both a Ford Anglia 105E and a Fordson Dexta tractor featured. The firm is still in business, and in the 1960's were agents for tractors, cars and commercials, and official agents for both Ford and Land Rover. This invoice, issued in October of 1967, was made out to a Mr Allen who'd just purchased a secondhand Wolseley 1500, registration 9659 WB, for the sum of £120. Two locations are given for Westaway Motors Ltd, one in Naseby, the other in Spratton. The firm first opened its doors in 1943 from the Naseby workshops, the business primarily focused on the repair of agricultural and military vehicles. As already mentioned, by the 1960s they were agents for various motor-car and farm equipment manufacturers (New Holland being one). Nowadays the firm deals in a number of Japanese and American marques. More items of motoring paperwork relating to old garages and motor agents can be found in the Motoring Collectibles section of oldclassiccar.co.uk.